Gorey Celtic come from a narrow 2-3 win away against Fethard Rangers. Forth Celtic come from a 3-3 draw at home against Moyne Rangers. Curracloe United has yet to be beaten in this competition, having won 6 out of its last 7 games. 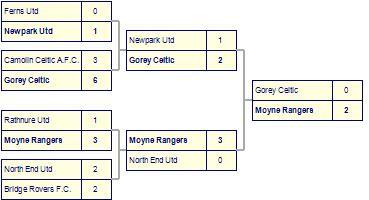 Gorey Celtic come from a comprehensive 0-4 win away against Gorey Rangers.